Another wonderful thing you see all the time in Rio de Janeiro is the handy combination of skateboards and bicycles. Friends pulling each other along to speed the journey. 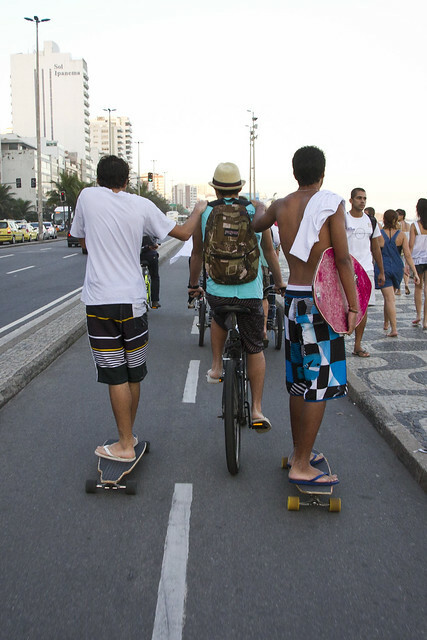 One of the distinct trends we hear at Cycle Chic have noticed - not just in Rio but in many of the cities we visit - is that skateboarding has become very trendy among the female demographic. Skater girls are taken to the streets, bike lanes and sidewalks of many cities more than ever before. Like we mentioned in the previous post, skateboards are used for fun and recreation but they really serve as transport when rolling along the beachside bicycle lanes. As always, we have a Flickr set featuring this subject. Bicycles and Skateboards from around the world. Hooray! These pictures are great! I took a second glance at these pictures. The guy, nonchalantly showing off his belly, is hilarious!